Christina Harms, 31, a labor and delivery nurse in Grand Rapids, Michigan, is celebrating National Nurses Week this week, as are her mother and her grandmother. 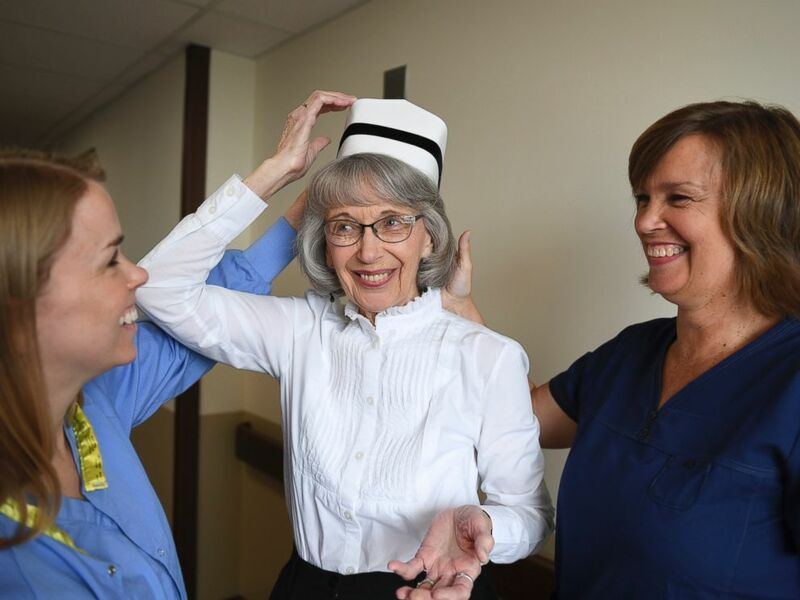 The three generations of women have all followed the same career path, working as labor and delivery and postpartum nurses, at the same Michigan hospital system for a combined nearly 83 years. Harms, a mother of two, began working for Spectrum Health in 2012 after deciding to give up a career in music to follow the career paths of her mom, Sue Hoekstra, and grandmother, Mary Lou Wilkins. Harms works nights in the labor and delivery department while her mother works day shifts in the postpartum department at the same hospital. Hoekstra helps care for Harms’ children during the day, just as her mother, Wilkins, did when Hoekstra was a young mom working the night shift. “My kids grew up with [Wilkins] as their day care provider as I slept and now I’m doing the same thing for my daughter,” said Hoekstra, 56, the mother of two sons in addition to Christina. It was Wilkins, now 86, who began the family tradition when she started her nursing career in 1949. She worked the night shift as well so she could be home with her three children during the day. Wilkins described herself as “really pleased” when her only daughter, Hoekstra, chose to enter the nursing profession too. Hoekstra graduated from the same nursing school as her mom and, in 1981, started working at the same Michigan hospital. Working generation to generation in same specialty at same hospital is great. I am pleased to inform you about bestessays and online writing services providing networks which can help young blood, buddies.